Member States notification of marine casualties and incidents, and reporting of data resulting from safety investigations in EMCIP, has been mandatory since 17 June 2011. This has allowed the Agency to assist the Commission and Member States with initial analysis of such data, the development of trend monitoring mechanisms, proposals for safety recommendations, the improvement of existing European legislation and promotion of new technical requirements. EMCIP provides the means to store data and information related to marine casualties and incidents involving all types of ships including occupational accidents related to ship operations. 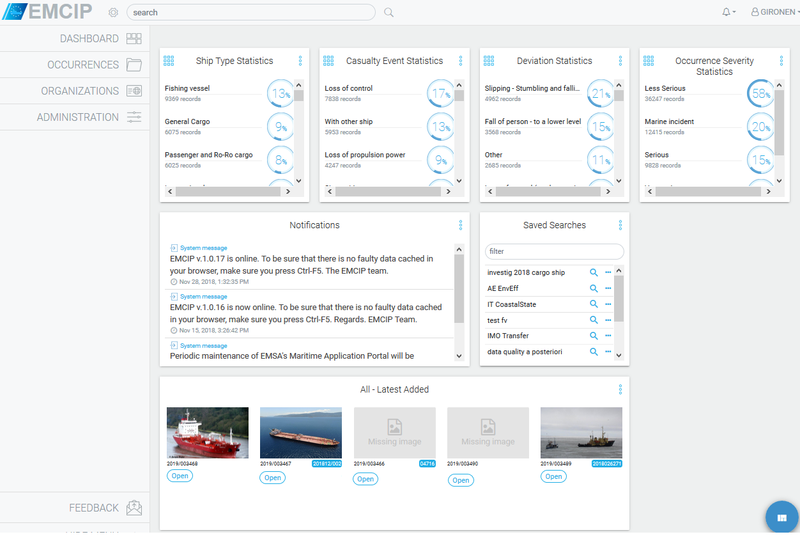 It also enables the production of statistics and analysis of the technical, human, environmental and organisational factors involved in accidents at sea. Furthermore, it allows Member States to report investigation findings to the IMO-GISIS system directly and without any duplication of effort. The database’s taxonomy has been developed by EMSA in consultation with the Member States, on the basis of European research and international recommended practice and procedures. Information about marine casualties and incidents is also made accessible to the public, such as the investigation reports published by the accident investigation bodies and “anonymized” data about casualties and incidents notified by Member States authorities. EMSA manages EMCIP on behalf of the Commission, hosting, providing maintenance and improving the system. EMSA has recently deployed a new EMCIP, directly hosted and managed by the Agency. The provision of information about marine casualties and incidents for the general public have been temporarily suspended. This information will soon be available again in line with the rules agreed with the Member States.